Earlier I did a quick once over for the Super Joy 3 that I own, and I didn’t quite go into too much detail. Today we are going to delve as deep into this thing as we possibly can without getting lead poisoning. 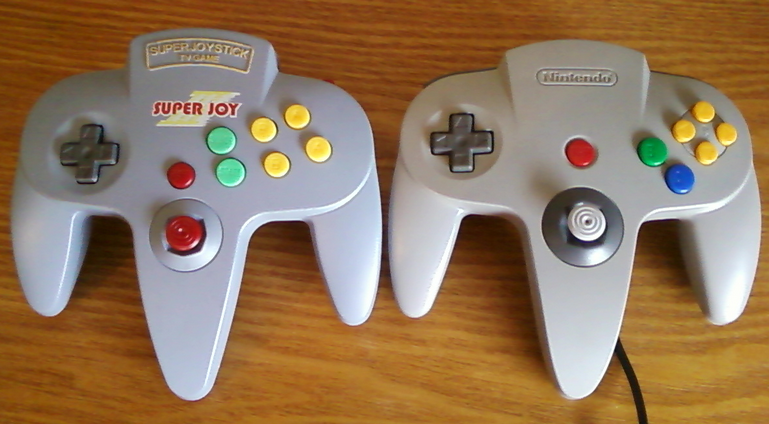 The very first thing you are going to notice when you pick up one of the Super Joy units is the fact that the housing looks a lot like a Nintendo 64 controller, so I will be comparing the two quite a bit. The second thing you’re going to notice is just how cheap and plasticky this thing feels, and that is pretty much the theme throughout. 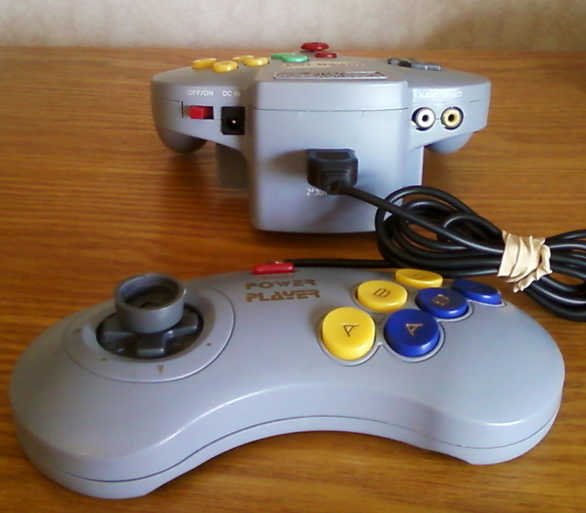 To start off, the controls are shoved quite a bit more to the center than they are on the N64 controller. 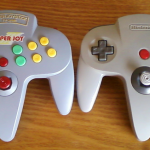 The D-pad is essentially the same, but its way off to the right of where it should be. 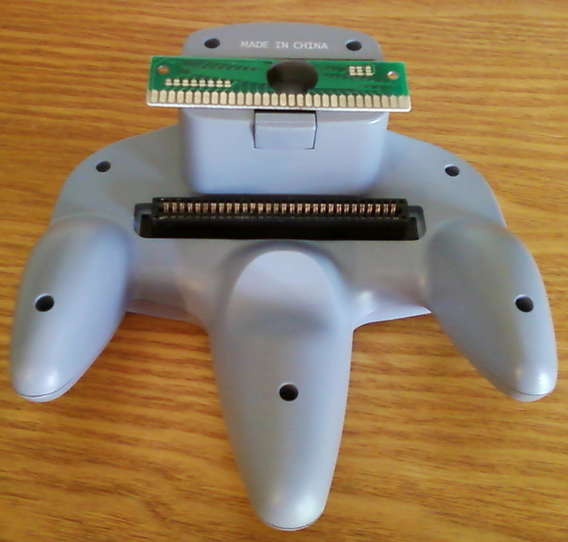 Instead of the C buttons, here you have 2 pairs of A and B buttons, one set being standard and the other set for turbo. More toward the center you have the Reset button next to a slant aligned Start and Select buttons, and a functionless joystick simply screwed on from the inside. 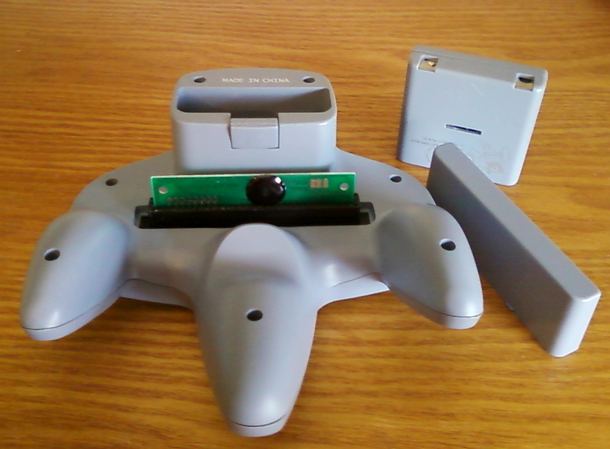 The Super Joy design has done away with the N64’s trigger and they’ve turned the memory card port into the battery pack holder. 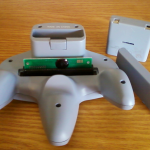 On the very top left you have the AV outputs, in the middle there is the typical and super cheap looking 9 pin controller port (much cheaper looking than Atari and Sega used) and to the right is the power adapter input and On/Off switch. Since I don’t own the right power adapter, I run mine off 4 AA batteries. Performance seems to be ok, although I can’t compare between the batteries and power adapter. 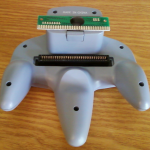 Underneath all Super Joy units, that I’ve seen, there is a 60 pin connector for running ROM boards (mine had a cover on it) which means your unit is either run off a ROM board or you can use Famicom cartridges with it. As you would expect from anything built in China, this thing is cheap and functions as such. Often times I will find myself hitting the A or B button and getting random reactions or none at all. 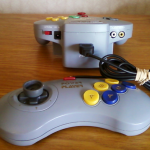 The D-pad seems to be only slightly inaccurate, but watch out for the extremely willing to work Reset button, which can often be confused for the start button when you need to pause a game in a hurry. The games within my Super Joy 3 (listed in a previous article) are obvious classics, as if they didn’t even really care about copyrights and didn’t try to hide what these games were. The games all function properly with the exception of Super Mario Bros., which is sped up quite a bit. Within the unit is a mess of wires and three different printed boards, one strictly to handle the controls, another is attached to the 60 pin connector and the other is the main brain of the clone. The wires look cheaply soldered into place and although I’m not a master at soldering either, it just looks like a mess. The extreme bare essentials are thrown in, the components are cheap and that causes a loud buzz in the audio and there are lines running vertically across the screen. The slot around the 60 pin connector on the bottom of mine is way to small for me to properly insert Famicom cartridges, but I did take the unit apart and they do work! Like wise, after I built my first Famicom to NES converter, I took the ROM board out of my Super Joy and played it on the NES, that works too! Some Super Joys have a bigger cartridge slot than mine, I believe mine was built strictly to be run off the ROM board in the hopes it would never be removed, they sure didn’t see me ever getting my hands on this thing! I bought my Super Joy 3 at a thrift store for around $4, and if I found another I would more than likely pay $4 for it too. Since this has the option to run off batteries, which have lasted longer than I thought, these units are ideal for packing with you for a trip. The games are fun and the unit is, for the most part, functional. I love playing the original games on the original hardware, but this thing just gives you so many choices that its hard to put it down sometimes. The issues with the audio buzz and lines on the screen tend to fade away, once you’re focused in on playing a game. It does lie and say it gives you 12000 choices while in reality it is only 120-ish, but even so I’ve found this thing to be a lot of fun.